Update: The City Council voted 6-1 to support the next phase of this project! For a powerpoint overview of the project. go here. 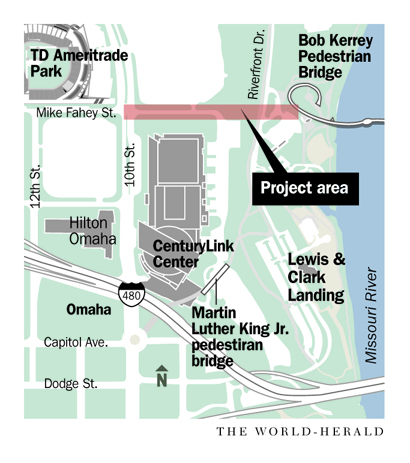 The Omaha City Council will hold a public hearing and vote this Tuesday (Nov. 26; see agenda here) on a contract to hire a consulting firm to complete preliminary engineering and environmental analysis; the first steps in creating a new downtown Omaha walking bridge connecting the Bob Kerrey Pedestrian Bridge directly to north downtown and TD Ameritrade Park. The $500,000 contract is the initial step in the overall process, paving the way to make the project a reality. This seems like a lot of money, but is not unlike other road and infrastructure projects and is required for federal funding. The majority of the funding (80%) for this phase of the project came from a competitive grant from federal highway. As noted in a recent Omaha World Herald article, this bridge extension project is part of the city’s 2009 master plan for the downtown area that sought to advance downtown’s economy. It will go a long way as well in encouraging more walking and cycling in Omaha, goals of the recently updated City Transportation Master Plan. The project will also build on the great success of the Bob Kerrey Pedestrian Bridge, which has proven to be a very popular with the public. Investing in cycling and walking makes good sense for their economic, and health and environmental benefits. And since people who choose to bike or walk subsidize driving, it’s only fair that we see more projects that enable safer and more efficient walking and biking. It may also help reduce congestion in the area, which will lead to savings for all mode users. Please contact your City Council representative now to express your support for projects like this that support more bicycling and walking in Omaha. The uno link mentions cyclists and sadly only mentions them as sports cyclist. Omaha cyclists are not just the sporty types, but many of us are also utility cyclists that get to work and do shopping by bicycle. Until this nasty stereotype is dropped, no progress can be made! I speak as a lifetime bus user and a bicycle commuter of 7 years, having never owned or driven a car (and never want to honestly). Great points John, thanks for saying something about it!